Scorpions look like tiny lobsters in front. In back, they have a long tail with a stinger at the end. It curls up and over their bodies. They have 8 legs, like spiders. Venom: The stinger has venom. The venom causes pain and other symptoms when it is shot into the skin. Size: average size is 3 inches (7.5 cm). Range in size from 1 - 7 inches (2.5 to 18 cm). Scorpions are most active at night. They like dark and moist places. There are about 40 types of scorpions in the US. All scorpions can sting, causing pain, tingling, and numbness at the sting site. Note: Some stings do not inject venom. The only US scorpion that can cause serious symptoms is the bark scorpion. See below. Children and older adults are more likely to have severe symptoms. People with chronic medical problems are also at higher risk. 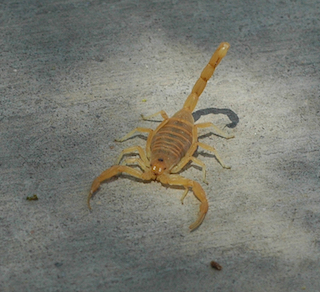 The only US scorpion that can cause serious symptoms is the bark scorpion. Color: bark scorpions are yellow-brown (tan) or orange in color. They are found mostly in Arizona. Also can be found in New Mexico, Nevada, California, and Texas. They also live in Mexico, Central America, and the Caribbean. Deaths in the US from a scorpion sting are rare. Note: Most people cannot tell a bark scorpion from a harmless scorpion. Catching or saving the scorpion to show your doctor is not helpful. Treatment is based on symptoms. Just kill the intruder. About 85% cause only local symptoms at the sting site. About 10% cause painful shock waves in the same arm or leg as the sting. Less than 5% cause any serious symptoms. All scorpion stings cause pain, tingling, and numbness at the sting site. Pain starts right away. The pain can be severe for the first 2 hours. Symptoms around the site start to go away over the next 24 hours. There is often no swelling or redness of the sting. About 10% of stings also cause waves of tingling. The tingling travels up the stung arm or leg. It feels like an electric shock. Most scorpion stings do not need to be seen. The main symptoms are pain, tingling and numbness only in the sting area. Symptoms shouldn't be any worse than a bad bee sting. Sometimes, the arm or leg with the sting gets waves of tingling and pain. Wash the sting site well with soap and water. Put it on the sting for 20 minutes. Until they go away, keep using the pain medicine as needed. Also, try to avoid bumping that arm or leg. Pain at the sting site is usually gone by 24 hours. Shock waves of tingling also gone by 24 hours. Numbness and tingling around the sting may last 2 to 3 days. Do not walk barefoot in the desert, especially at night. Scorpions are most active at night. Check your shoes before you put them on (shake them). Shake out clothes, towels, bedding, and sleeping bags before using. Roll back your sheets at night, before getting into bed. Clear away any piles of wood or debris that are near the house. Scorpions hide there. Weatherstrip your windows and doors. Place the legs of a baby's crib in wide-mouthed glass jars. Scorpions can't climb glass. Hire a pest control expert for repeated problems. This image shows the frontal view of the bark scorpion of Arizona.